Annotation: Promote good citizenship with a fundamental understanding of the document on which our nation was founded. 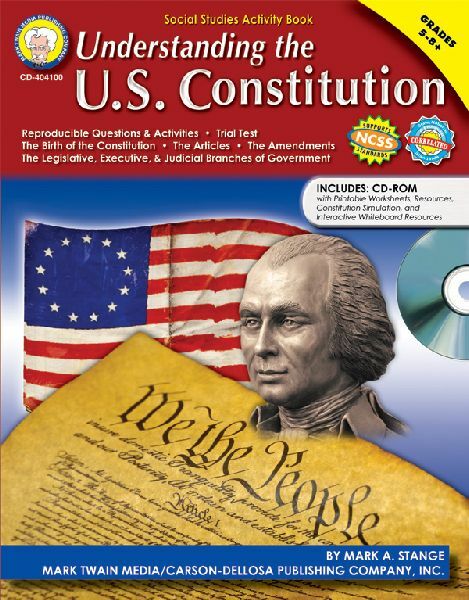 This helpful classroom resource includes activities and lessons on the birth of the Constitution, amendments, and branches of government and is sure to paint a definitive picture of the workings of our government. It also includes a valuable CD-ROM full of printable worksheets and interactive whiteboard resources, as well as meeting NCSS correlated standards. --Mark Twain Media Publishing Company specializes in providing captivating, supplemental books and decorative resources to complement middle- and upper-grade classrooms. Designed by leading educators, the product line covers a range of subjects including mathematics, sciences, language arts, social studies, history, government, fine arts, and character. Mark Twain Media also provides innovative classroom solutions for bulletin boards and interactive whiteboards. Since 1977, Mark Twain Media has remained a reliable source for a wide variety of engaging classroom resources.